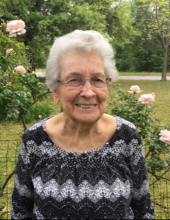 Mary Lavinia Brunson Williams, 91, died February 14, 2019 at her home. Ms. Williams was a daughter of the late Edgar Rubin Brunson and Lillie Cook Brunson. She was retired from Gatlin's IGA and a member of Fairfax First Baptist Church. She loved her family and loved gardening, She also loved visiting with her church family and friends. Ms. Williams is survived by two sons, Anthony Dorn Williams; Timothy Dean Williams, and one daughter, Brenda Darline Williams Weaver; seven grandchildren and nine great-grandchildren; two sisters, Sara Cook and Frances Crosby. She was predeceased by two sons William Grady Williams, Jr. (Bill) and Dwight Ruben Williams, three brothers,Billy Brunson, Herman Brunson and Frank Brunson, four sisters, Hatti May Gohagen, Barbara Jean Stevenson, Betty Brunson and Ivy Lee Thompson. Funeral Services will be 1:00 P.M.Tuesday, February19, 2019 at Fairfax First Baptist Church with the Reverend David Janaro officiating. Interment will follow at the Brunson Cemetery. To send flowers or a remembrance gift to the family of Mary Brunson Williams, please visit our Tribute Store. "Email Address" would like to share the life celebration of Mary Brunson Williams. Click on the "link" to go to share a favorite memory or leave a condolence message for the family.